With little (visible) progress on platform, how long will buildout over railyard take? Surely past 2025. Railyard payments can be stretched through 2030. 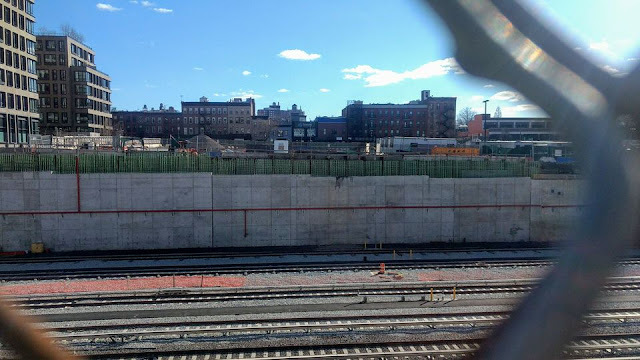 This is the fifth of five articles regarding the 3/15/19 meeting of the Atlantic Yards Community Development Corporation (AY CDC), set up to advise the parent Empire State Development (ESD). 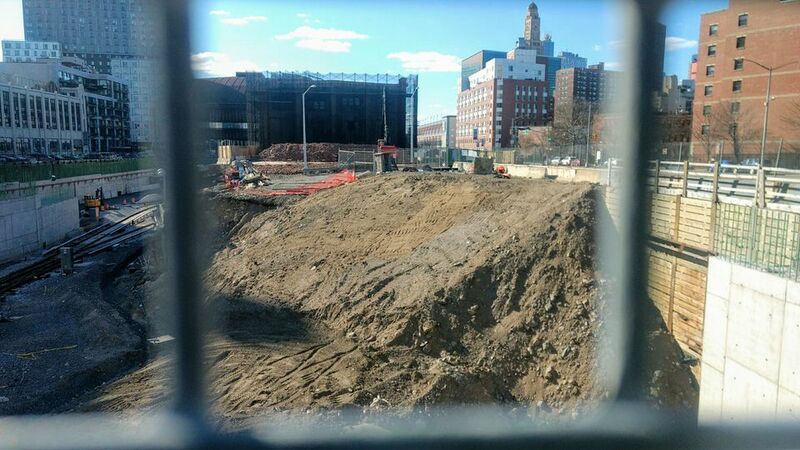 The first article concerned the expected 2022 completion date for the middle school. The second article concerned the board's inability to hire independent consultants. The third article concerned updates from the AY CDC President and from developer Greenland USA. The fourth article concerned a failed effort to get a building-by-building timetable for affordable units. To get to 2,250 affordable units by May 2025, as I wrote yesterday, it looks like all or most of the project must be built by then, unless... some buildings contain a greater percentage of affordability than contemplated in current subsidy programs, and/or affordable units are included in Site 5, contemplated for office space. Or, perhaps, the deadline might be stretched. of infrastructure to support platform and buildings? 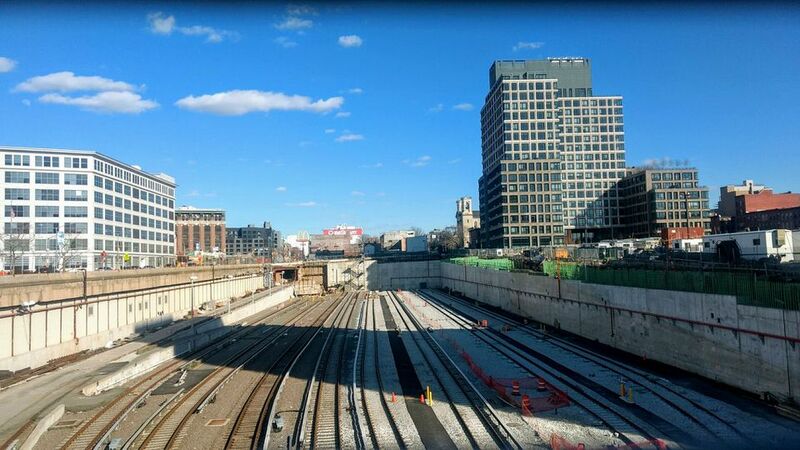 How realistic is it that the six buildings over the railyard--B5 through B10--will be built by 2025? Not so much, though surely some, perhaps three, might be built by then. All such buildings require significant and costly infrastructure--a foundation and platform--to support vertical development and to protect the railyard functions below. So if only some of those railyard towers are built by 2025, one or more might contain more than the 25% or 30% affordability available in the Affordable New York subsidy program. 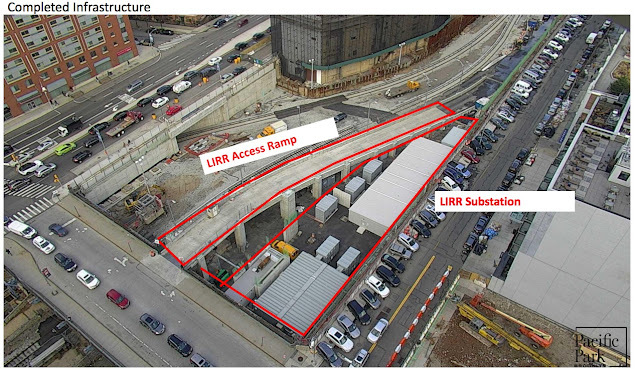 What's unclear, as I explain below, is how much of that infrastructure is completed, though walls have been shored up, and some rebar sticks out. No columns are visible, much less steel trusses to support the concrete deck, according to the photos I took on 3/17/19. Platforms would be built over the open, below-grade portions of the newly relocated Vanderbilt Yard. One platform would span over the below-grade portion of Block 1120 and a second platform would span over Block 1121. 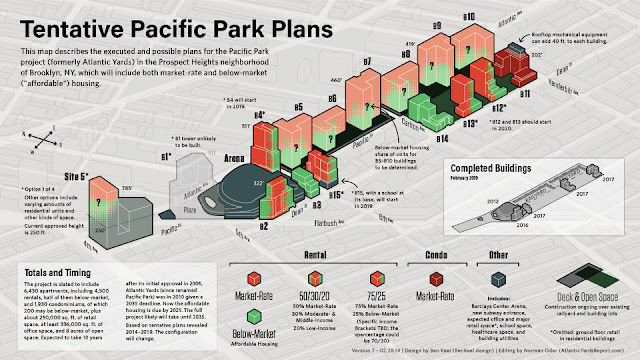 The platform would provide a base for the Phase II buildings on Blocks 1120 and 1121 (Buildings 5, 6, and 7 on Block 1120 and Buildings 8, 9, and 10 on Block 1121). The construction techniques and sequencing for both platforms would be basically the same. Columns and shear walls would be constructed on the mat foundations for future buildings. Large steel trusses, running north to south, would be supported by the columns and the shear walls. Concrete would be poured upon decking, which would have been placed on the steel trusses to form and finish the platform. Greenland has until 2035 to build the entire project--and until 6/1/30 to pay for railyard development rights, with the last of 15 annual payments of $11 million due by then. So there's no obligation to build the entire project, as suggested in documents from 2014 (also further below), by 2025. Why wouldn't they wait five more years to pay $75 million for development rights? It's clear now that the developer aims to first build on the middle block of the former three-block railyard, known as Block 1120, between Sixth and Carlton avenues and Pacific Street and Atlantic Avenue. 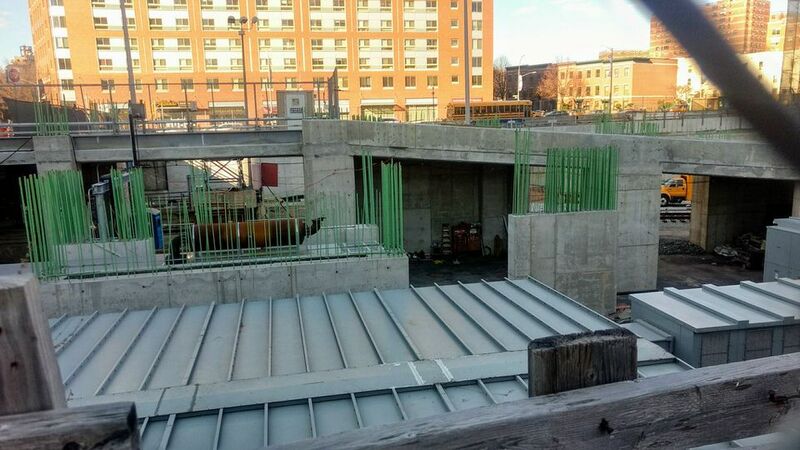 A photo of the western end is below, from the developer. "Greenland Forest City is in design of B5, and commencing design of B6 and B7," Solish said at the 3/15/19 meeting of the Atlantic Yards Community Development Corporation (AY CDC), "so we'll be coming back with additional information as that design progresses." He made no mention of the last three buildings: B8, B9, and B10. But it would be very difficult to construct six large buildings over a yet-to-be built deck and have them finished by May 2025, given the infrastructure challenge, cost of construction, the need for financing, and the difficulty in leasing up bunches of units. Building those initial three towers is more plausible. 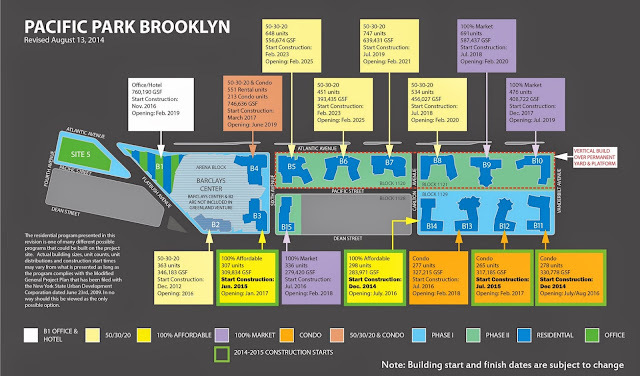 After all, as of August 2014 (map below), the first building over the railyard (B10) was supposed to open in July 2019, which presumed a 2017 construction start and thus at least an eight-year process to get all six railyard buildings built. That presumed a buildout from east to west along the railyard, rather than the opposite, which is now the plan. In fact, three towers over the railyard were supposed to have started in 2017 and 2018. None have launched. Given that two towers are starting this year (B15 and B4), and two later this year or next year (B12 and B13), the developers surely want to manage the supply, and be wary of having too many units on the market at one time. It's just not realistic, from a construction, engineering, financing, and marketing perspective, to get six large buildings financed and built in six years, by 2025. As noted, Greenland may not want to reveal a specific timetable, not just because it has until 2035 to build the entire project, but also because the affordable units may have to be delivered before the project is finished, unlike the 2014 projection. 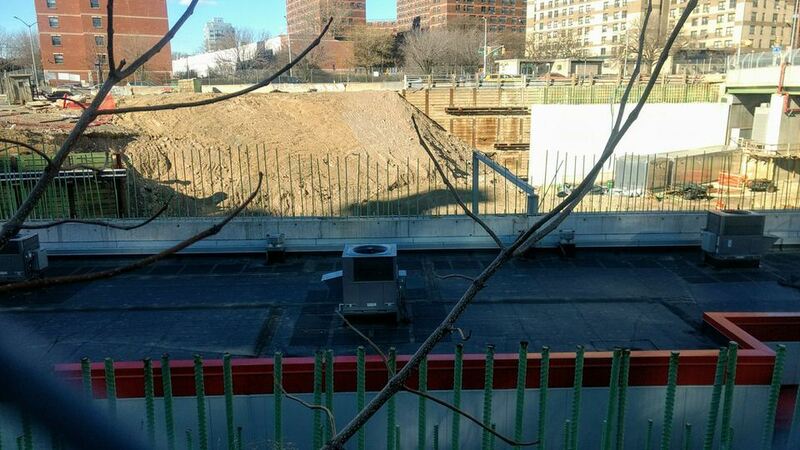 It's unclear how much of the preliminary work for the deck has been done. In 2014, original developer Forest City Ratner requested and gained an amendment to its plan to reconstruct the Vanderbilt Yard, which would "authorize it to commence early foundation work for the platform to be constructed over the LIRR Permanent Yard during the construction of the LlRR Permanent Yard; and (2) in recognition of such increased scope of work, extend the construction completion deadline for the LlRR Permanent Yard until December 1, 2017." That deadline didn't hold. The permanent yard is not yet finished, but rather is due later this year. Timetables tend to stretch. 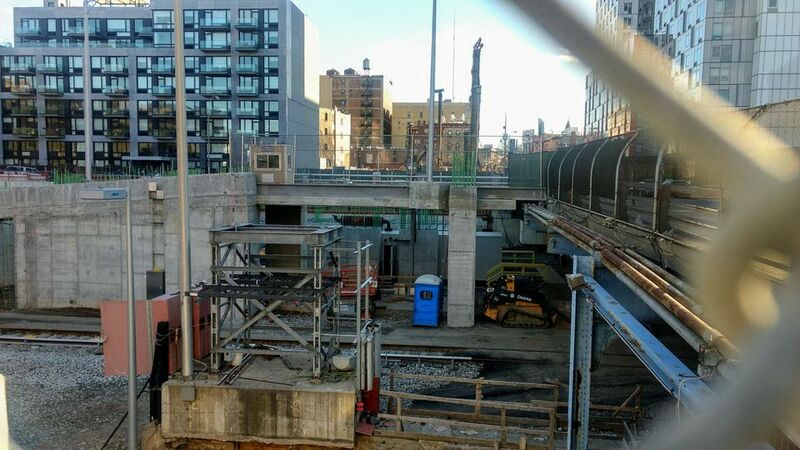 As I wrote in March 2018, Forest City a month earlier had disclosed--to securities regulators, not the public at large--"In 2015, we notified the MTA of a force majeure delay of approximately 16 months, due to unforeseen site conditions." The public material leaves some fuzziness. It's unclear exactly what "early foundation work" entails. 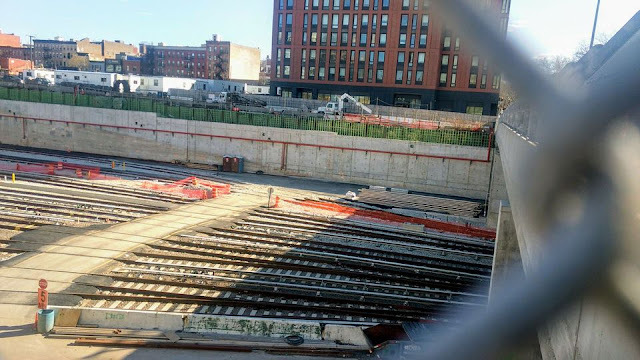 As I wrote, Forest City Ratner's letter about the plan, while stating it "would accelerate our ability to complete the construction of the platform over the yard," did not estimate how much time would be saved, how much of the necessary work would be completed, or when the platform would be built. 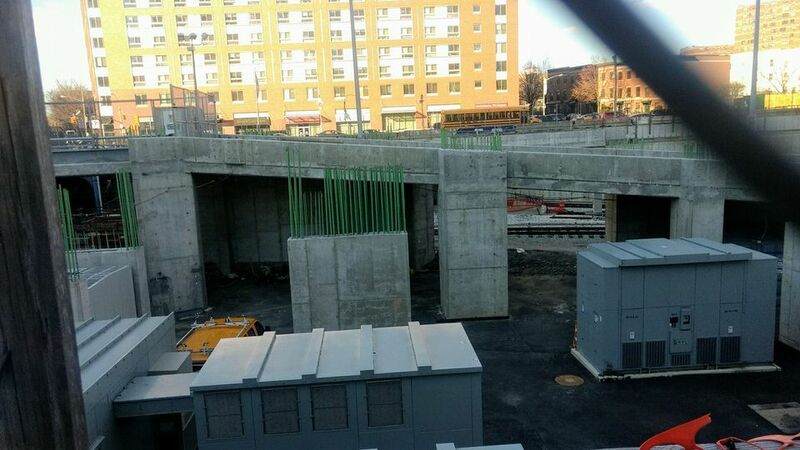 The work was to require installation of 95 caisson piles, each taking two days to install, using two drill rigs. Indeed, some of those 24" caisson piles have been installed in the railyard, according to past Construction Updates, but it's not clear if 95 were installed, or, even if so, how much of a foundation precursor that represents. 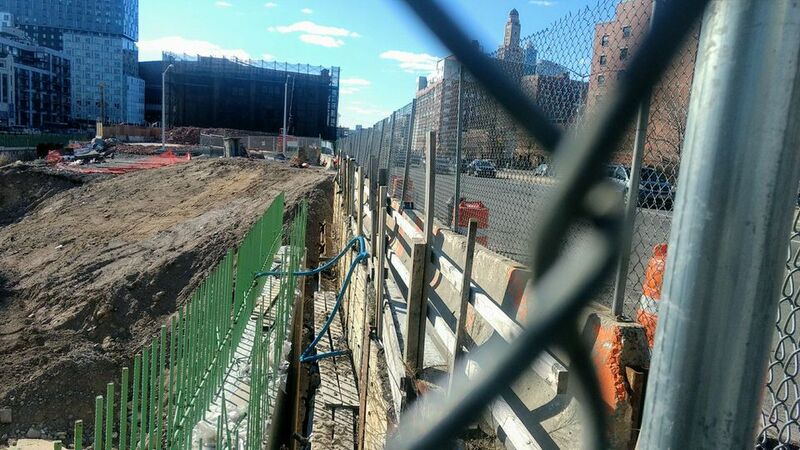 I queried the developer and Empire State Development but got no response. 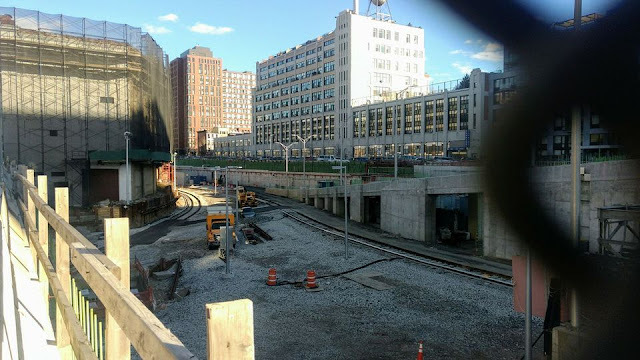 Update: in January, Greenland was asked, "Have the footings been installed for the buildings planned for the western block of the railyard, between Carlton and Vanderbilt avenues and Pacific Street and Atlantic Avenue? "The preplacement of foundations is finished," Greenland USA's Scott Solish said. 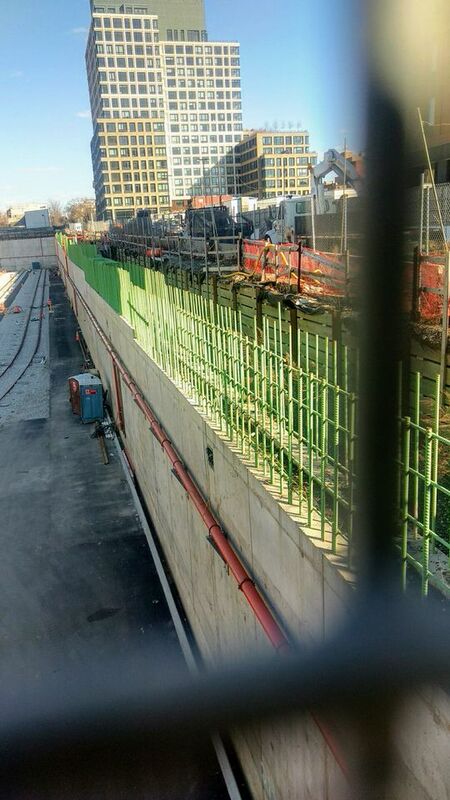 While there may be some "early foundation work" done, it's hardly clear how much "building and platform foundation" work is complete, as the photos indicate. The 2014 SEIS disclosed three illustrative construction phasing plans, which were not meant to predict the exact schedule but illustrated how the timing of certain project components could vary. 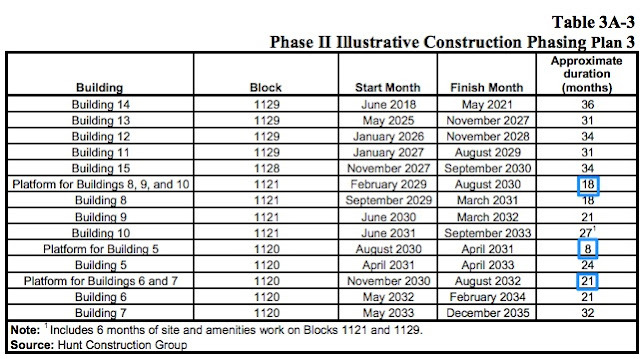 Upon completion of Blocks 1129 and 1128, there would be a two year period during which the platform for the Block 1121 buildings (Buildings 8, 9, and 10) would be built. Construction on Buildings 8, 9, and 10 would begin at the end of 2027. 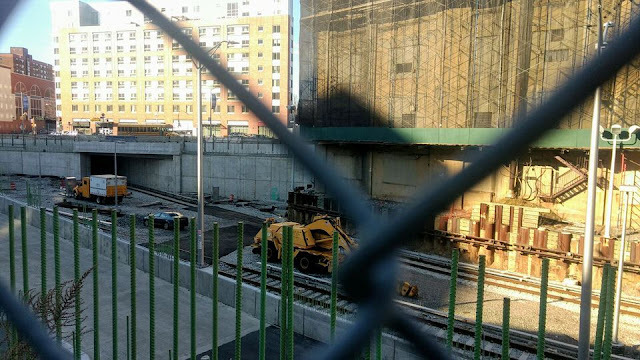 Construction on Block 1121 and the adjacent Pacific Street street bed would proceed west to east over a roughly four year period, transforming that area from an open rail yard and construction staging area to publically accessible open space and residential buildings with ground floor retail. When construction on Block 1120 is nearly complete (in 2027), the open rail yard on Block 1121 would be platformed over. 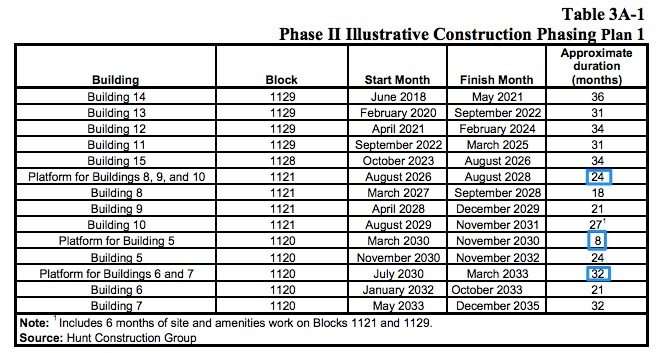 The residential buildings on Block 1121 (Buildings 8, 9 and 10) would be completed from west to east between 2029 and 2031. 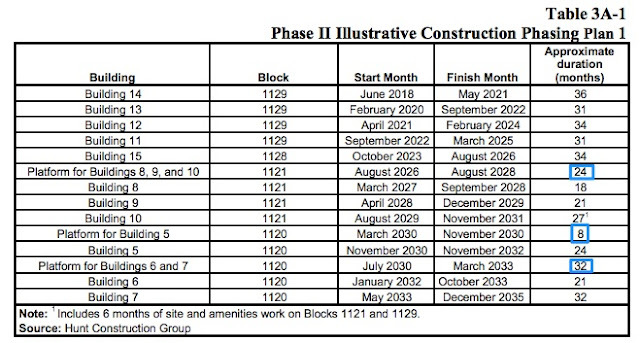 Block 1121 would be built out over the course of approximately 3.5 years, with approximately nine months of construction on the platform preceding the building construction. 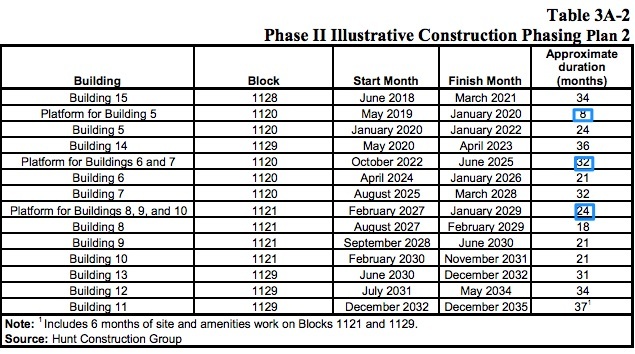 Block 1120 would be built out over the course of 5.5 years, with approximately nine months of platform construction preceding building construction. The SEIS Construction Overview chapter disclosed three potential phasing plans for a delayed buildout scenario--not necessarily what the developer would follow. In all three plans, the platform for B5 would take 8 months to build. The platform for B6/B7 would take between 21 and 32 months. The platform for B8/B/9/B10 would take between 18 and 24 months--not nine months as described in the text above. The bottom line: getting all that done by 2025 would be a stretch. Below are photos of the two railyard blocks, taken last Sunday, 3/17/19. Block 1120 has significant Long Island Rail Road facilities, plus two large parcels where street-level terra firma, once supporting two buildings (now demolished or under demolition), jut south from Atlantic Avenue; Block 1121 has a broad expanse of railroad tracks. Looking south at Block 1120, Atlantic Avenue just east of Sixth Avenue. Looking north from Pacific Street near Sixth Avenue. Most pillars support a ramp, some concrete pieces stand alone. Looking northwest from Pacific Street between Sixth and Carlton avenues. Looking west toward the Barclays Center from Carlton and Atlantic avenues. There's a retaining wall. Looking south from Atlantic Avenue in between Carlton and Vanderbilt avenues. Looking south from Carlton Avenue and Atlantic Avenue.